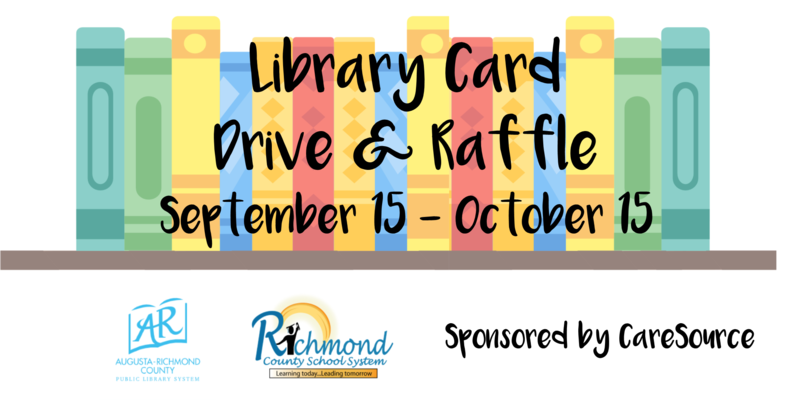 We invite all Richmond County School System elementary school families, teachers, and staff to sign up for a library card at their local Richmond County public library to receive a passport to new worlds of knowledge and adventure–their own library card—AND a raffle entry! The school with the highest percentage of participants will receive a FREE Fiesta of Fun! Other prizes are also available! Sign up or renew your library card at your local Richmond County library between September 15 and October 15, 2018. Then ask for a raffle form from the library staff member. You can start the registration process online and finish it at your nearest Richmond County library. Where are the Augusta-Richmond County Public Library System library branches located? We have 5 locations currently open throughout Richmond County (Maxwell Branch is going through a renovation). How old do you need to get a library card? Anywhere from 1 day old to 120 years old–if you’re alive, you can get a library card. Children and youth under 18 years of age must have a parent or guardian with them to sign for their library card. Can everyone in my family get a library card and a raffle entry? Yes.We’d love for everyone in your family to have his or her very own library card! Check out books and DVDs (adults only can check out DVDs), log on to computers and wifi in our libraries, download eBooks and magazines, and access millions of online subscription resources. If an adult has fines, can their children get a library card? Yes. We want all children to be able to have a library card regardless of whether or not their parents or guardians have fines. What’s the difference between a library card for a person under 18 and a card for adults? Children cannot check out DVDs, and their parents or guardians may choose to restrict their Internet access.